To earn the achievement, users can "run, walk, cycle, wheelchair or swim" in a workout of at least 30 minutes using Apple Watch or any third-party app that writes workout data to Health Kit. 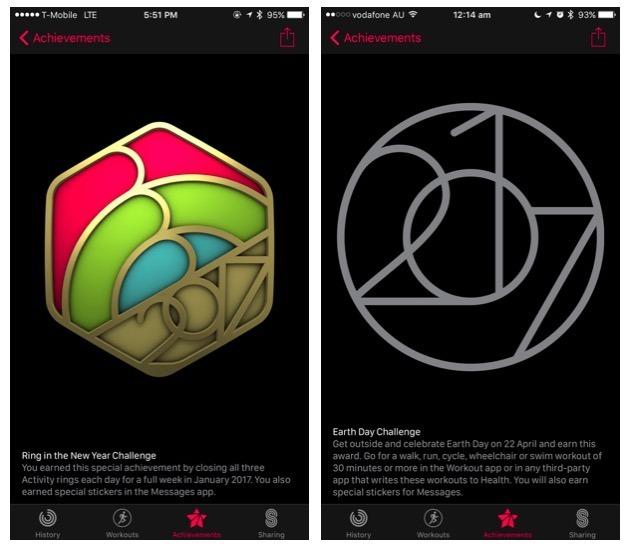 Apple began incrementally adding the achievement challenge within the iOS Activity app to users as Earth Day approached. Twitter user Patrick in Melbourne, Australia was among the first to post an image of the Earth Day achievement (above). Apple has previously created special achievement challenges, including last year's U.S. Thanksgiving holiday as well as a "Ring in the New Year Challenge" during the month of January. In addition to feeling good about achievements earned in the Activity app, users also gain access to digital stickers that can be shared in iOS 10 iMessages.